Should be moderate in length (rather short than long), very thick, deep and strong. It should be well arched at the back (presenting a convexe profile at the top), with much loose, thick and wrinkled skin about the throat, forming a double dewlap well divided on each side, from the lower jaw to the chest. The shoulders should be broad, sloping and deep, very powerful and muscular, and giving the appearance of having been "tacked on" to the body. If the shoulder is not sloping enough (i.e. too upright), the movement will be stilted and uneven. The brisket should be capacious, round and very deep from the top of the shoulders to the lowest part where it joins the chest, and be well let down between forelegs. It should be large in diameter and round behind the forelegs (not flat-sided, the ribs being well rounded). The forelegs should be very stout and strong, set wide apart, thick, muscular, and straight, with well-developed forearms, presenting a rather bowed outline, but the bones of the legs should be large and straight, not bandy or curved. The inner forelegs will form a near square from the top of the legs and across. A vertical rectangle between the front legs indicates that the front is too narrow. They should be rather short in proportion to the hind-legs, but not so short as to make the back appear long, or detract from the dog's activity, and so cripple him. The elbows should be low, and stand well away from the ribs. The pasterns should be short, straight and strong. A horizontal rectangle indicates that the front legs are too short. The chest should be very wide, laterally round, prominent, and deep, making the dog appear very broad and short-legged in front. The back should be short and strong, very broad at the shoulders, and comparatively narrow at the loins. 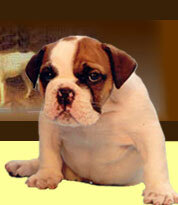 Viewed from above, the correct Bulldog, should show the characteristic wedge or pear-shaped outline. The body is broad and heavy in front, narrower and lighter behind, as illustrated on the right. The powerful shoulders and neck are particularly noticeable in such a top view. The body should be well ribbed up behind, with the belly tucked up and not pendulous. suddenly to the tail, forming an arch - a distinctive characteristic of the breed - termed "roach back".